An announcement by Chris Grayling of Government funding for a study into a possible new road has raised controversy after the transport secretary used the announcement to promote local Conservative candidates. 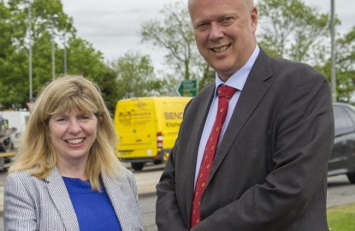 Mr Grayling announced on a visit to East Sussex earlier this week that the Government will spend £3m on a survey into the possibility of a new dual carriageway section of road north of the railway between Lewes and Polegate. The announcement was welcomed by the local council but its timing has proved controversial, with rival political parties in the area calling it a ‘bribe’ and ‘electioneering’. The announcement was made in conjunction with Maria Caulfield, MP for Lewes in the last Parliament and Conservative general election candidate for the area, and the former Conservative MP for Eastbourne and current candidate, Caroline Ansell. Both are marginal constituencies. Ms Caulfield has posted on her website a letter from Mr Grayling disclosing the decision. The letter is dated 19 April - the day after the election was announced. Mr Grayling stated in his letter that he would be asking Highways England to allocate £3m to develop a ‘larger’ A27 scheme from £75m previously allocated for ‘smaller-scale improvements'. A spokesperson for the Cabinet Office told Transport Network that Mr Grayling had announced the funding in this letter, with his announcement this week being a ‘political’ re-announcement, rather than a Government announcement. During election campaigns, both government departments and ministers are expected to observe non-statutory purdah rules and not make official announcements or decisions that could be seen as party political. While the period of purdah for the general election began at midnight on 21 April, a re-announcement after that date for party purposes would not be seen as a breach of purdah. A spokesman for Highways England told Transport Network that Mr Grayling had met the Government-owned company’s chief executive, Jim O’Sullivan, on 19 April and that the funding for the study was discussed at this meeting. Transport Network has also approached Mr Grayling and Ms Caulfield for comment. Last week the Crown Prosecution Service announced that a number of Conservatives elected to Parliament in 2015 would not face criminal charges over election spending allegations.